Bio-Oil is an award-winning specialist skincare product that is clinically proven to improve the appearance of scars, pregnancy stretch marks, and uneven skin tone. 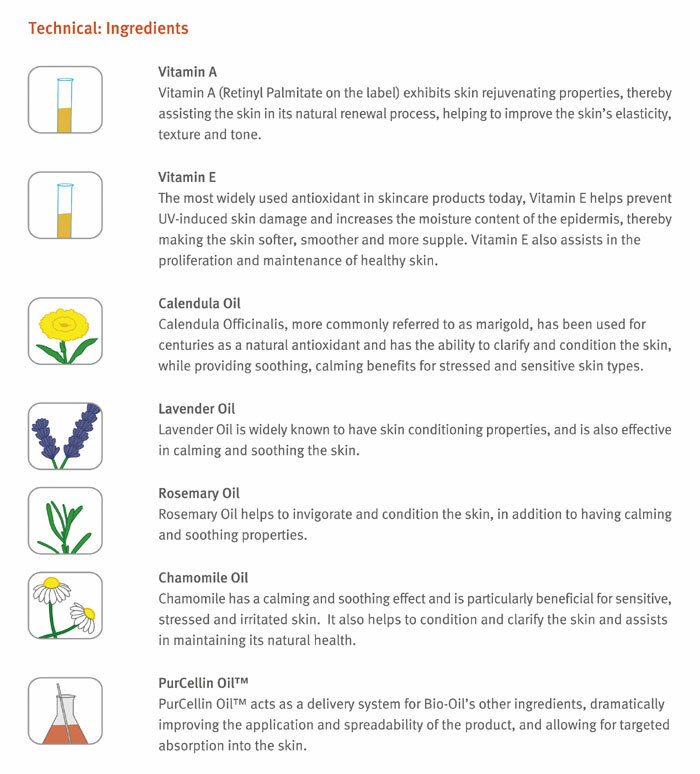 Thanks to PurCellin Oil, a proprietary laboratory copy of the preen gland oil of ducks, Bio-Oil is also effective for many other skin conditions such as aging and dehydrated skin. Bio-Oil includes the breakthrough ingredient PurCellin Oil, a recreation of the preen gland oil of ducks. During preening, a duck secretes oil from its preen gland and distributes it over its entire plumage in the familiar twisted-neck action that one often associates with ducks. This oil creates a thin, non-greasy layer on the surface of the feathers without which water would not pearl off and the bird would struggle to swim. This ingredient acts as a delivery system for Bio-Oil's other ingredients, improving spreadability and allowing for targeted absorption into the skin. Also, because oil contains no oxygen, it provides an exceptional storage environment for vitamins. 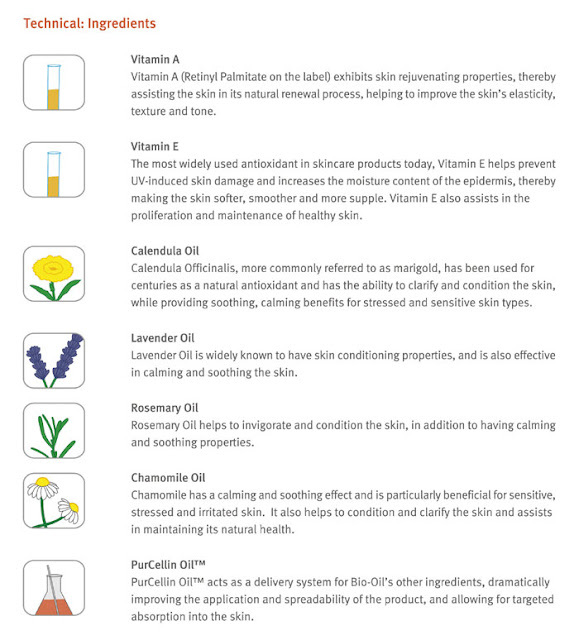 Bio-Oil includes many beneficial skin ingredients such as Vitamin A, Vitamin E, calendula oil, lavender oil, rosemary oil, and chamomile oil. This mix of plant oils and vitamins has been clinically shown to be beneficial to the skin. Bio-Oil helps improve the appearance of all types of scars and is also highly effective in helping maintain elasticity of scar tissue on joints and other high-mobility areas, including stretch marks. Ideal for pregnant women, particularly in their second and third trimesters, Bio-Oil is the product most recommended by UK pharmacists to help reduce the appearance of scars, stretch marks, and pregnancy stretch marks. Bio-Oil helps improve the appearance of uneven skin tone caused by excessive sun, hormonal fluctuations, or skin-lighteners. Sagging and wrinkled skin that is associated with aging also benefits from Bio-Oil. Much wrinkled and sagging skin is caused by the weakening of the collagen and elastin support system in the dermis. 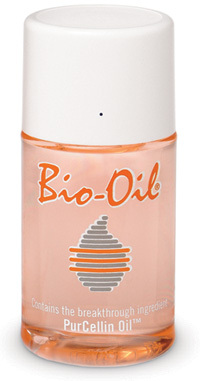 Bio-Oil helps soften and smooth the skin, making it more supple and reducing the appearance of wrinkles. Bio-Oil also does a wonderful job at moisturizing and has sufficient moisturizing properties so as to render an additional moisturizer unnecessary. Bio-Oil is a non-acnegenic and hypo-allergenic product, meaning it has a decreased tendency to cause allergies and acne, and it is safe for use on sensitive skin.